Saia Florist is a professional floral and gift shop that has been proudly serving Greenville, Mississippi and surrounding areas since 1956. We hope you enjoy your online shopping experience with secure 24-hour ordering right at your fingertips. If you prefer, you may call us to place orders direct at 662-332-7092 or 800-437-9259. It is our pleasure to assist you with any local, as well as worldwide deliveries and remember that corporate accounts are always welcome. We have daily delivery service to local funeral homes & hospitals. Wedding & Special Event Flowers ~ Get rave reviews from guests at your wedding, holiday party, or corporate event with flowers and on-site decorating by Saia Florist! We have wedding rentals available as well. Call us in advance to schedule a consultation with one of our talented floral professionals. 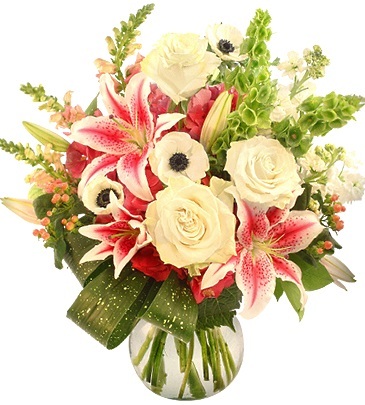 Sympathy Flowers & Tributes ~ Ask our staff about customizing a sympathy tribute to a departed friend or loved one. You can count on us to help you choose funeral flowers that beautifully convey your expressions of sympathy and serve as a lovely memorial to the deceased. Variety of All Occasion Gifts ~ Browse our assortment of Dish Gardens and Green & Blooming Plants for a gift that instantly brings life to any room or office. Don’t forget we also make delicious Fruit & Gourmet Baskets, Snack Baskets, Candy Baskets and Gift Baskets of any kind. In addition, our shop carries a nice selection of Balloons, Stuffed Animals, Baby Gifts, Picture Frames, Home Décor, Scented Candles, Silk Floral Arrangements and more. Thank you for visiting our website for flowers delivered fresh from a local Greenville, MS florist, Saia Florist.